During a break in the investigation at the Three Crowns Hotel, Leigh on the sixth of July 2011 I took some photos of the main room with a Kodak Easyshare CX7530 5 mega pixel digi-cam. This is what showed up on one of the photos. It does not appear in the photo I took sevral seconds later once my flash had recharged, however there are a couple of the more normally encountered 'orbs' on the photo following that. 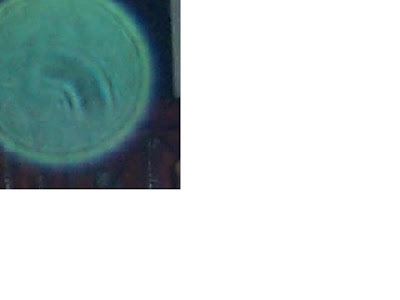 Usually dust or moisture orbs are see through, but this one appears to be solid with a strange 3D like formation in it. What it is I do not know.